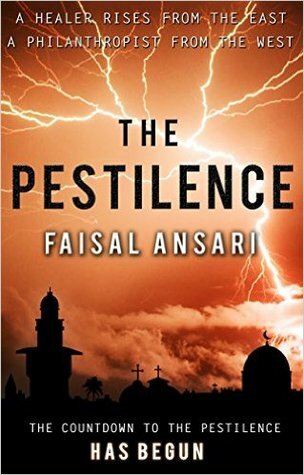 The Pestilence by Faisal Ansari is a highly recommended debut thriller featuring good vs. evil. There is now peace in the Holy Land. On the Srour family farm near a small village, Samuel Srour is taking care of his animals when a rocket attack is launched. The attack and subsequent retaliation destroy the farm and seem to set a world wide electrical storm into motion. The electrically charged storm/cloud travels around the world, with lightning pulsing through the clouds. "The lightning which comes from the east, shines as far as the west, turning night into day." The phenomenon originated from the Srour farm. Two men are changed by the lightning storm. Samuel Srour should be dead after the direct hits which destroyed his farm, but instead he now sees people's auras and has the power to heal. Samuel and his longtime friend/girlfriend, Mariam Fara, set off healing people and/or giving them immunity. Samuel wants no compensation or nothing from the healing. The other changed man is business man Victor Pierre Chaput. From all outward appearances, he seems to be a philanthropic man, but now that he has power from the storm too, he has other plans. The Pestilence features a countdown timeline of the days to the start of The Pestilence. The action moves swiftly and the countdown increases the tension since you know something awful is going to happen. Take note, however, that The Pestilence doesn't hit until the very end of the book and that this is book one of a new series, The Jerusalem Chronicles. Readers may also want to take note that this is loosely Biblically based on Revelations so it may be a long extended series like The Left Behind books. Disclosure: My Kindle edition was courtesy of Matador Publishing via Netgalley for review purposes.